Properties in Taulis average 4.7 out of 5 stars. 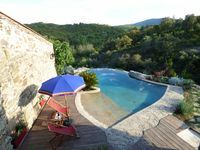 Property 20: House in large private garden,mountain views,dogs welcome,village+shops 5 mins. New studio for 2 people in the countryside with direct access to the pool. Property 21: New studio for 2 people in the countryside with direct access to the pool. Property 31: Stay in a Medieval Village! Quiet, spacious and cosy two bedroom apartment. We had a perfect stay here in tis beautiful cottage! The setting is beautiful, the attention to detail is beyond expectations, the pool is a dream, and the hosts are wonderful! Highly recommended!! My husband and I thoroughly enjoyed our time in this home. 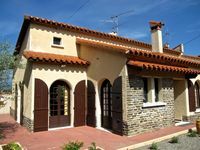 It has all the amenities and the bonus is the short walk into the village to buy groceries, have a coffee or to sit and enjoy a glass of wine and people watch in the little square. There are eating out options in the village as well. It is a wonderful location for day tripping in both France and Spain (too many to list). We highly recommend this home and will look forward to coming back one day.